For the first time in the history of the Greek Community of Melbourne (GCM), 92% of the organisation’s membership endorsed the Board’s motion to develop the Bulleen property, an unresolved issue plaguing the organisation for many years. The vote was considered by all present, as a vote of confidence to the GCM’s Board of Directors and its President Bill Papastergiadis. 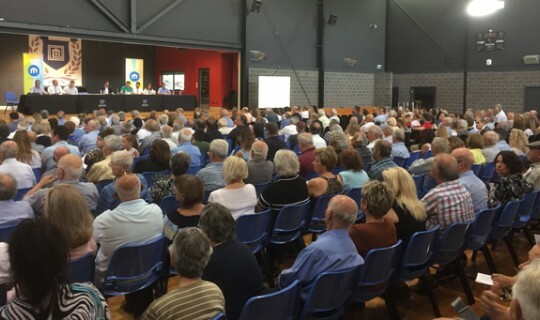 The vast majority of the members who attended the Special General Meeting (SGM), held on Sunday at the Alphington Grammar School, gave the green light to the Board to proceed with the development of the Bulleen property and the creation of the new Greek Centre on the Yarra. According to the results of the ballot, of the 561 members who voted, 513 voted "yes" (92%), 47 "No" and one invalid. The unprecedented historical result reflects the confidence that members have in the current Board, which has shown professionalism, dedication and hard work for the progress of both the GCM and the Greek community in general; and the true testimony of this, is the gem of Hellenism, the 15 storey new building in the CBD. 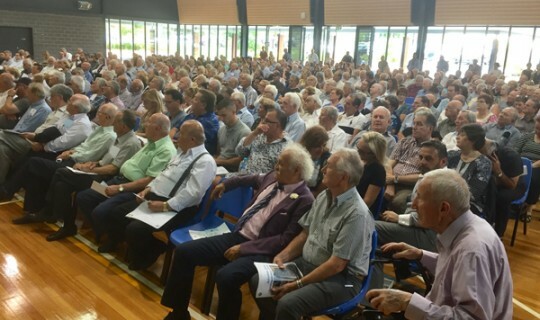 On Sunday afternoon, hundreds of members flocked to the «Andrianakos Centre», to vote for the development of the Bulleen property, which remains undeveloped and desolate for over 30 years. It must be noted that both the SGM and the AGM were held in a calm atmosphere, without the usual controversies and disagreements. Also, the large presence of non-members indicates the interest of the community for both the Bulleen and the GCM. Members applauded President Mr Bill Papastergiadis and Vice Presidents Mr. Nick Koukouvitakis and Mr Theo Markos, and all those who took the floor supporting the proposal of the Board - they invited the members to approve the Board’s proposal, stressing that we must not "miss this unique opportunity." In recent weeks dozens of Greek organisations and individuals publicly supported the Bulleen proposal. 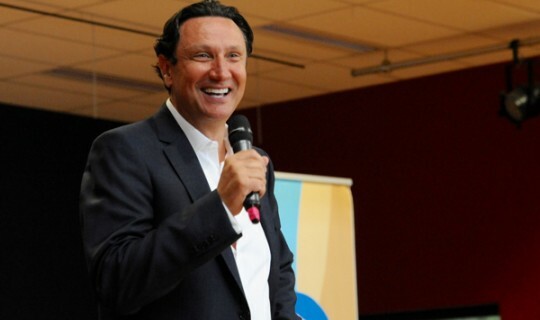 President Bill Papastergiadis spoke about GCM’s achievements during the last few years. “This is a result of hard work and good management,” he said.